Roll formed profiles are used for many different applications in various industry fields, while the requirements of each line of business vary greatly. Different specifications call for verified manufacturing strategies tailor made for the respective job definitions. 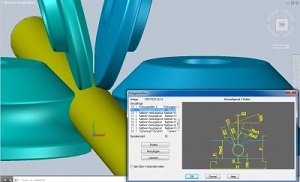 With its product portfolio data M offers an integrated roll forming solution concept consisting of four parts regarding design and simulation of the entire roll forming process as well as devices for quality control of roll tools and profiles. While COPRA® RF covers the complete engineering process with flower design, calculation and profile design among others, COPRA®FEA RF provides simulation by means of non-linear elastoplastic calculation for a variety of possible problems profile manufacturers of today are facing. COPRA® RollScanner and COPRA® ProfileScan Desktop round off the package by offering accurate optical measuring of roll tools as well as profiles with full integration into the COPRA® workflow.